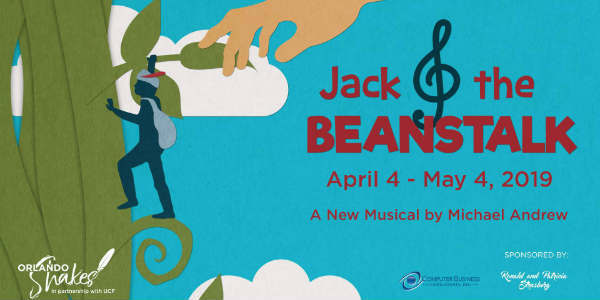 Orlando Shakes in partnership with UCF, will perform Jack and the Beanstalk, a new family musical by Michael Andrew, at the John and Rita Lowndes Shakespeare Center from April 4 – May 4, 2019. I spent my Saturday afternoon with my friend Patti, at the Bob Carr P.A.C. in downtown Orlando. We were there to see the matinee performance of My Funny Valentine, a concert featuring Michael Andrew and Swingerhead, backed by the Orlando Philharmonic Orchestra. They played for almost two hours, including an intermission. The orchestra went solo for the first song, “Cuban Overture,” by Gershwin. Then Andrew and his band took the stage for several romantic songs by the likes of Johnny Mercer and Cole Porter. 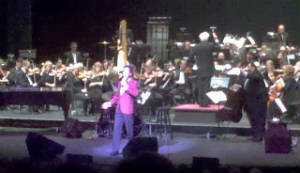 Andrew also performed a trio of songs from the musical he co-wrote, based on the Jerry Lewis movie, The Nutty Professor. He performed the songs in character, and he sounded just like Lewis. After the intermission, Andrew returned to the standards catalog for more love songs by the likes of Dean Martin and Carmichael/Parish. He closed the show with a medley of Marvin Hamlisch tunes. I have to single out Swingerhead band member Bobby Brennan for his bass solo. I’m a fan of the upright bass, to begin with, but he got seriously funky during his solo. 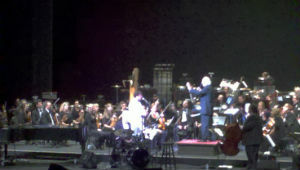 It was a lovely concert and I’d like to thank the Orlando Philharmonic for inviting us to see it. February is the month associated with love, so it’s only fitting that the Orlando Philharmonic is partnering with Michael Andrew and Swingerhead for a concert of romantic swing hits. 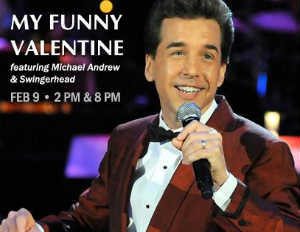 My Funny Valentine will be guest-conducted by Albert-George Schram, and feature songs like “Night and Day,” “My Funny Valentine,” “L-O-V-E,” and “Almost Like Being in Love.” There will also be selections from the Broadway-bound musical, “The Nutty Professor,” in which Andrew recently played the title role in the world premiere. There will be two shows on February 9, at 2pm and 8pm, at the Bob Carr P.A.C. Ticket prices run $29 to $70, with select tickets available with a student discount. Prior to the 8pm performance, the Orlando Philharmonic’s young patrons group, Overture, will host a Valentine-themed martini social at 6:30pm. Passes are $10 in advance and $15 at the door, and it includes hors d’oeuvres and two complimentary drinks. RSVP to 407-896-6700 x236..